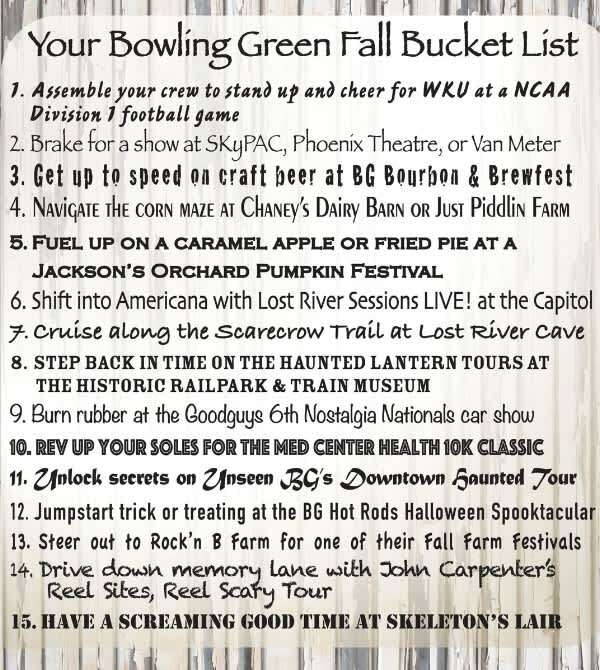 Top 15 Reasons to Visit Bowling Green, Ky. this Fall! When a town claims "Master of Horror" John Carpenter as a former resident, you can be pretty sure there are some fun events going on during the fall season! Besides seeing the real life Smiths Grove (the sanitarium from which Michael Myers escaped was fictional unfortunately), here are our Top 15 Reasons to Visit BGKY this fall, in no particular order of course! Click the links below for more details or head over to our Fall page for the fully-loaded rundown! 1. Get up to speed on craft beer at BG Bourbon & Brewfest. 2. Brake for a show at SKyPAC, Phoenix Theatre, or Van Meter, or catch a Lost River Sessions LIVE! at the Capitol Arts Center. 3. Navigate the corn maze at Chaney’s Dairy Barn or Just Piddlin Farm. 4.Fuel up on a caramel apple or fried pie at a Jackson’s Orchard Pumpkin Festival. 5. 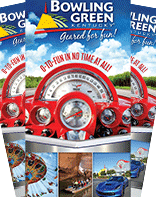 Cruise along the Scarecrow Trail at Lost River Cave. 6. Reverse in time on the Haunted Lantern Tours at the Historic Railpark & Train Museum. 7. Unlock secrets on Unseen BG’s Downtown Haunted Tour. 8. Have a screaming good time at Skeleton’s Lair Scream Park and meet the "new" Michael Myers Oct. 19-20! 9. Drive down memory lane with John Carpenter’s Reel Sites, Reel Scary Tour. 10. Jumpstart trick or treating at the Bowling Green Hot Rods Halloween Spooktacular.